When I was a little girl in Thailand, my favorite street snack, Kanom Krok, were sold not in a Styrofoam or even paper box, but in a little boat made of Bai Tong, banana leaf. (You cut a rectangular piece from a large banana leaf, fold two corners on one side over each other and nip them together with a tiny sharpened wooden stick. Do the same on the other end and you get a cute little boat.) Back then, so many desserts and even savory dishes were served in packets and containers made of everything from lotus leaf, banana leaf, or even the long, thin pandan leafs woven into a basket. Those were the original green packaging, local and sustainable. Then plastic became less expensive, and the even cheaper Styrofoam arrived. The opportunity to pollute the environment was equalized for all. These days when I go home, I find less and less of the wonderful natural packages. And when I see them, I can't help but snap a photo or two, keep sakes of time gone by. The first photo on top of this post is a packet made from folding the two ends of an oval piece of banana leaf, fastened with a thin strip of the same material, and secured with a sharpened stick. Hoe Bai Tong, as we call it in Thai, is used for a variety of steamed food, savory and sweet. This one is a photo of Khao Lahm. Tubes of bamboo filled with sticky rice with coconut milk, sweetened with palm sugar. The tubes are filled with the cooked rice then let burnt in smoldering ash, to develop a gooey texture and a deliciously caramelized note. There used to be plenty of these spatchcocked chickens on the grill at practically every street corner. Each chicken is kept in place with a tricky maneuver of splitting a thick stick of bamboo into two layers of fork-like tines, then slip the chicken in between the two layers, letting the strong bamboo tines secure the chicken in place. When a chicken is cooked and sold, a buyer can simply take home the entire chicken-on-a-stick. No extra bag needed. This last photo is of another one of my favorite snacks. They are called Kanom Jaak, made of the meat of the Jaak palm mixed with coconut milk and flour, then wrapped in the leafs of the Jaak palm itself. Kanom Jaak is cooked on the grill, with the long Jaak leaf making it pretty easy to hold on to the ends while turning the package over the fire. 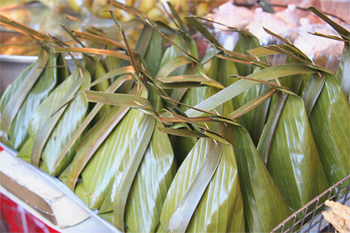 The Jaak leaf also contribute a distinctive aroma to the Kanom itself. These little tricks are quite ingenious, aren't they? They are simple yet elegant solutions that take advantage of local and renewable resources. Unfortunately, even among these few examples that remain, there are signs of the inevitable. Change is coming and it would take more than my photo documenting to stop it. Looking closely, you will see that the thin Kanom Jaak packages are now closed with stapler clips instead of Mai Glat or the tiny sharpened sticks. The Khao Lahm in bamboo tubes, once topped by the thin membrane taken from the inside of the bamboo tubes, are now covered instead with gaudy plastic. It's only a matter of time, I supposed, before this beautiful tradition disappears completely. Meanwhile, I am snapping a shot of every one of these that I come across. I may only have the photos to remind me of them before long.